Basic writing wisdom, if there is such a thing, says when writing a scene, get in and get out. Get in at the last possible moment before the point of the scene and leave the scene and move on soon after that point is made. That applies to novels as a whole as well. When I was reading submissions as a literary agency intern, I noticed that authors often had too much backstory in the first two chapters. Or the first chapter was all exposition. I'm guilty of this too, especially in first draft when I'm exploring the idea. 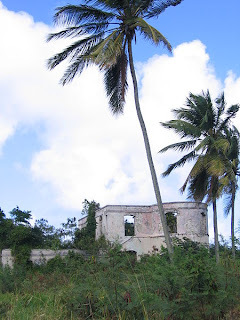 Ruined plantation house in Saint Lucy, Barbados. Attribution: Postdif from w.
But in the case of my WIP, I've decided that some backstory is necessary to show. My characters lived in the Caribbean before moving to England in 1800. The book opens as they sail toward Bristol. But after ruminating on it and reading Plot and Structure, I see that "the first doorway of no return"--the first plot point--is an important character death which sends my fictional family away from the West Indies to England. Hence, research on the West Indies in the 1790s. Britain and France were at war from 1793 until 1815. I vaguely knew that Britain and France got up to a lot of island hopping and fighting among their Caribbean territories during this long conflict. But since I didn't intend to set any of my book in the Caribbean--despite my characters' connection and past on Barbados--I skimmed over that and concentrated my research more on Britain in 1798-1801. Yeah. Big mistake. If you ever find something during research that will provide background, even if you think you won't use it, do make note of it. Barbados was a calm island in the 1790s. It was considered to have a good proportion of whites to blacks and most of its slaves had been born and raised on the island by the 1790s. It was the first Caribbean island that many British ships reached and docked at upon entering the West Indies. Barbados did not have a revolt until 1816. But there were fears on Jamaica, for instance, of a major slave revolt. Why then, specifically? St. Domingue, now Haiti. St. Domingue was a French colony. It was the largest market for African slaves and produced 30% of the world's sugar supply. It produced more sugar and coffee than all of the British West Indian islands combined. Sketch of the Haitian Revolution, 1791. From Wikimedia Commons. In 1791, St. Domingue's slaves rose up in rebellion, inspired by the French Revolution taking place in their mother country. They burned, killed, slaughtered across the northern part of the colony. The French were confident they could put down the revolt. 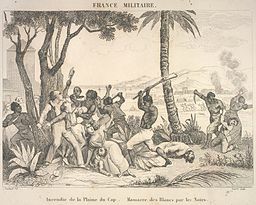 But the slaves evaded the French soldiers and the Assembly then granted full rights to mulattos, then in 1794, formally decreed the end of slavery in French territories. Britain, with warships in the West Indies to protect its own colonies, swept into St. Domingue, eager for the colony's sugar, welcomed by French royalist planters. Britain also captured the French territories of St. Lucia, Martinique, and Guadeloupe.